You won’t believe how incredible these Apple Pancakes are. I still can’t! These Apple Pancakes with Apple Cider Syrup will have your house smelling like fall. Well guys, its about that time of year. The time of year where the smell of apple, pumpkin and cinnamon fills the air. I know the majority of you still have your grills out and are searching for some of the best tailgating recipes for the Big Game(s), but for those of you who can’t wait to see the leaves change the beautiful colors or red, orange, brown, and purple and to put on the knee high boots, this recipe of apple pancakes is for you. Growing up, one of the many things I looked forward to with my family were celebrations and events. Every summer we would visit a small farm north of Dayton, Ohio called Young’s Dairy Farm. We would play with the farm animals and enjoy some ice cream that was made right there on the farm. It was a real treat that is a staple in my childhood. We would also ride around some of the nicer neighborhoods ( I grew up what some call “the hood”) to see the Christmas lights in the winter and of course, I can’t forget Halloween! My mom couldn’t afford to get us the entire costume so we would wear our regular clothes with a mask of our choice. Yeah, I know, its pretty ghetto. But those were the moments I looked forward to, year after year. It wasn’t the Christmas lights, the Halloween mask, or the ice cream on the farm that made me happy, it was having all of my family around me. Those events were simply the opportunities that aided the memories of happiness for me and I want to do the same for my son. I want him to become excited year after year and look forward to holiday festivities and events just like I did while I was growing up. The one thing that I am going to give my son that I was not given as much, is delicious seasonal food starting with these Apple Pancakes. I want my son to wake up every Christmas to the smell of my homemade cinnamon rolls; I want my son to salivate the entire day he is school over the Candied Apples that we will make every Halloween; and I want my son to look forward to his mommy’s Apple Pancakes with Apple Cider Syrup every fall as an indication that fall has arrived. Food is important to me and not because I need it to live, but because it is my way of showing love to those I love and appreciate the most in the world. It is an invitation to my heart and an extension of who I am. I am not talking about when I make Sloppy Joe’s. I’m talking about when I make my grandma’s Fried Apples, Turkey Chili, or these Apple Pancakes. What I love the most about these Apple Pancakes is the real apple that is in them and I am not talking abou diced apples. I cooked the apples to make them soft and to pull out the apple flavor so you get it when you bite into them. These fluffy Apple Pancakes are delicious. But I am failing to mention the best part of this dish and I am not talking about the apple. I am talking about the Apple Cider Syrup that goes with it. I honestly can’t imagine eating these pancakes without this syrup. At first, I thought it was going to be a bit too sweet but it is perfect! 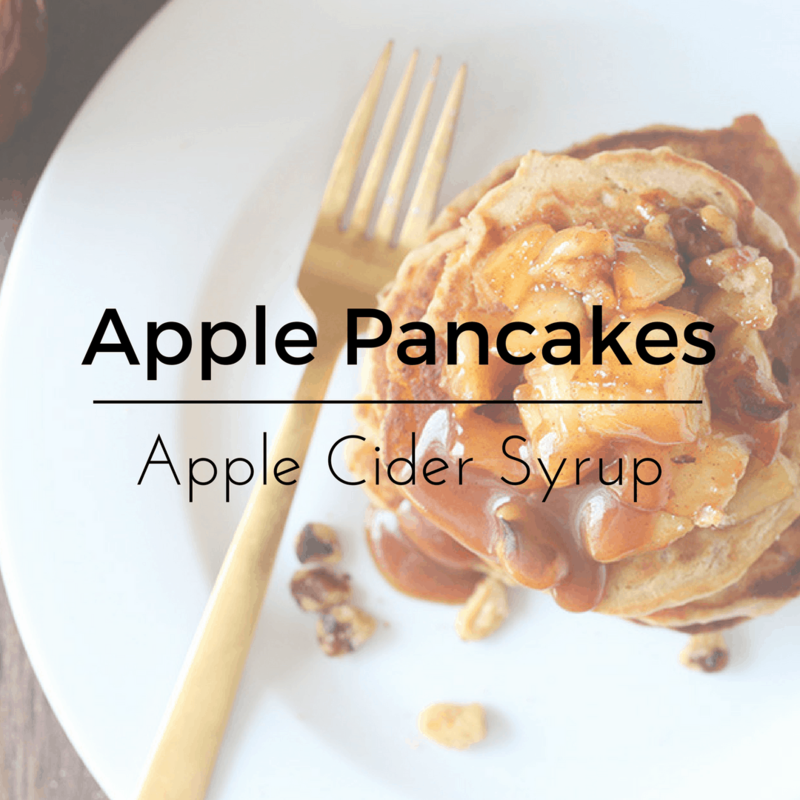 You cannot eat these Apple Pancakes without this Apple Cider Syrup. These pancakes are perfect for the fall and you will want to make them every fall. When my husband tried them, he said, and I quote, “These pancakes let’s me know that fall is coming. They should be sold in a restaurant”. So you see, my appreciation is already being felt and my family memories are well underway. These Apple Pancakes is the perfect breakfast dish for fall. Just serve with Apple Cider Syrup and enjoy the fall season. In a saucepan, on medium high heat, add both sugars, cornstarch, cinnamon, nutmeg, apple cider, and lemon juice and bring to a slight boil. The sauce will thicken and allow to cook for 5-10 minutes or until desired consistency is reached. Remove from heat and add vanilla extract and butter and stir until butter is melted. Pour in an airtight container or mason jar. In a medium saute pan on medium heat, melt the 2 tbsp. Butter. Add the apples and 2 tbsp. Sugar. Cook for 10 minutes until apples are soft cooked through. Pour in a bowl and mash the apples while still leaving chunks of apple. You can use an immersion blender to mash the apples or a food processor. Set aside. In a large bowl mix together the flour, sugar, baking powder, salt, cinnamon, and nutmeg. Whisk together. Pour in the milk, vanilla extract, and melted butter. Mix together until well mix. Fold in the mashed apples until well mix. Heat the griddle on 350 Degrees and melt 1 tbsp. Butter. Once melted, pour ½ cup of pancake batter onto the griddle and allow to cook on one side for 3 minutes and flip and cook on the other side for 3 minutes. Repeat until batter is finished. Top with Apple Cider syrup. If you would like to top off with apples, repeat the first part of this recipe and cook another apple and a half in butter and sugar. Top off with walnut pieces.